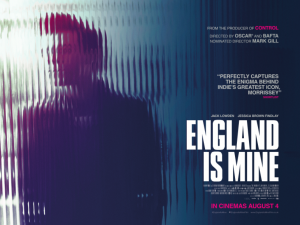 The film poster for the new Morrissey biopic England Is Mine has been released. Jack Lowden, who starred in the recent BBC adaptation of War & Peace, stars as Davyhulme-born Morrissey. Downton Abbey’s Jessica Brown Findlay co-stars as his close friend Linder Sterling, the artist and musician. The film will premiere at the the 71st Edinburgh International Film Festival on July 2nd and goes on general release on August 4th. England Is Mine, which was not authorised by Morrissey, is about the early life of the Smiths front man and is directed by Oscar nominee, Mark Gill (The Voorman Problem) and produced by Baldwin Li and Orian Williams (Control).